Given the the weather and the current lack of a barbecue of my own this is the only way I can get some barbecued ribs for dinner at home. I'm cheating quite heavily by using the liquid smoke but the end result clearly justifies the means. The ribs might not taste quite as good and cooking them might not be quite as satisfying as if I had been able to pop them onto a barbecue, but they're still good. I'll tell you what, give them the full two hours in the oven and you'll get some ribs that taste mighty fine and just about make themselves fall off the bone. I used to be able to find liquid smoke in the normal supermarkets here but at the moment I'm having to tap the internet to find a fix for my craving. Have a look at your closest friendly hot sauce site for example. Normally I tend to go quite simple on the sides for this, just some fries and a good homemade slaw does the trick for me. For the 'sweet dry rub' you can either buy a dry rub and just add some soft brown sugar to it or make your own. I don't have any set rules/proportions for my dry rubs, I just freestyle them at the moment. Some of the most used ingredients are paprika, salt, pepper, garlic granules, dried mustard, ground ginger, cayenne pepper, chili flakes, ground cumin and so on and so on... Once you've mixed a couple of these you know what you like and how to mix it to suit different types of meat and flavours. What's not in the recipe is the optional addition you can do at the end of the cooking. If you feel like it you can remove the ribs from the foil parcel, get rid of the meat juices, slab on some barbecue sauce. Then finish the ribs off by caramelizing the barbecue sauce for a couple of minutes under the grill. 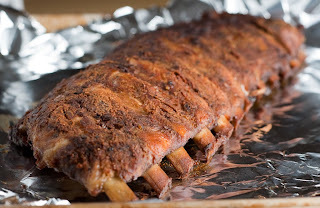 Put the rack of ribs on a piece of tin foil large enough to fold completely around the ribs. Brush a thin layer of liquid smoke on both sides of the ribs. Spread and massage in the sweet dry rub on both sides of the ribs. Close the parcel and make sure to seal it well. Let the parcel rest in the fridge for at least a couple of hours or even better - over night. When it's time to start cooking, heat the oven to 160c. Pop the tin parcel onto a baking tray and cook for 1.5 - 2 hours or until the ribs are done to your liking. You can check the doneness at intervals to make sure that they are cooked to perfection. Remove from the oven, take out of the tin parcel, slice up and serve with the sides of your choosing. Interesting idea… This looks delicious. Tanks for this great post. There are quite a few dry rubs out there, and each one has its own taste. It would be helpful if the recipe or the brand was included in the post. I am going to start blogging. I have heard that the blog platforms matters a whole lot.